EBITA or Earnings Before Interest Taxes and Amortization is a efficiency measurement that calculates a company’s operational profitability by including equipment costs and excluding financing costs. This ratio is one of many metrics that accountants, analysts and investors use to measure a business’ earnings and profitability. It’s a common derivative of EBIT and EBITDA(EBIT excludes amortization, while EBITDA includes Depreciation and Amortization). Depending on the type of company, an analyst will typically use one of these ratios, or potentially all three, to help better understand the earnings of the company. EBITA is important to measuring the core profitability of a business where measures like gross revenue and net income can often be misleading based on variables such as the corporate tax rate a company is in, one time expenses that may be applied during a corporate buy out, or even certain accounting tactics that are designed to give companies large tax breaks during their most profitable years. This metric is designed to measure a company’s operating profitability without regard to financing costs of capital expenditures. This is particularly helpful for analysts when valuing companies in industries that require large investments in depreciable assets or fixed assets. A metric like EBITDA can be misleading because these companies typically take large amounts of depreciation that have little impact on the cash flows of the business but drastically reduce the profits of the business. EBITDA adds back the deprecation expense and can artificially increase the appearance of profits that the company has. This can be pretty misleading for companies with large depreciation expenses because the actual cost of the assets are not being properly represented. Thus, EBITA is typically used to give the real value of a company’s earnings or its profitability while including the cost of aging assets but removing the financing costs associated with them. Let’s see how to calculate EBITA. The EBITA formula is calculated by subtracting the cost of goods sold and operating expenses less amortization expense from gross revenues. This calculation is typically considered the direct method because it computes the total straight from the total revenues. You can also use the indirect method to calculate the EBITA equation by adding the interest expense, taxes, and amortization back to net income. This equation is pretty simple. 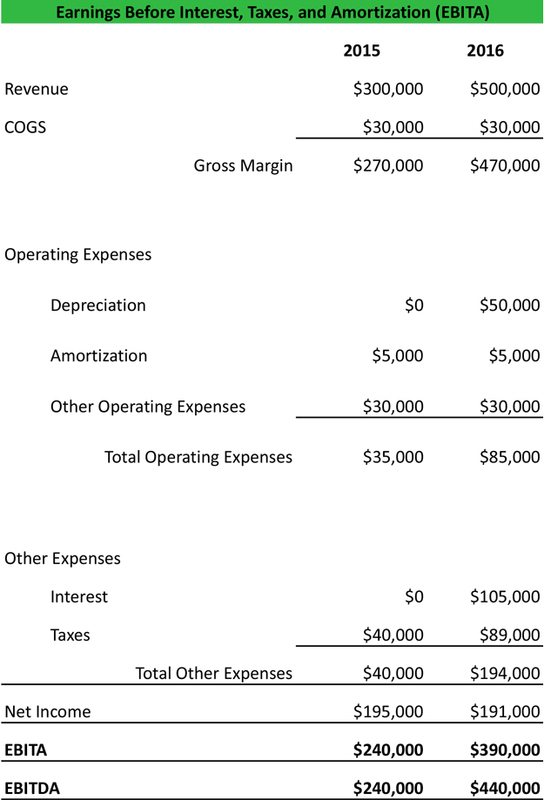 All of these figures are found on the income statement. Depending on what type of financial records you have will dictate which equation you will use. For example, some non-detailed income statements don’t readily break out cost of goods sold and operating expenses. In this case, you could easily use the indirect method because all income statements will include the interest, tax, and amortization expenses. Maria’s ice cream parlor has been a local landmark in her community for decades. In 2015, she had total revenues of $300,000 and a net profit of $195,000. Maria believe that she can increase total revenues and net income if she expands the parlor and purchases a new ice cream machine in 2016. Thus, she takes out a loan and starts the expansion process. At the end of 2016, Maria was right. The new expansion drove sales up to $500,000, but net profit actually decreased to only $191,000. This sluggish increase in profits can be explained by calculating Maria’s EBITA. Here are sections of her income statements for 2015 and 2016. As we can see, her earnings before interest, taxes, and amortization increased drastically from 2015 to 2016 even though her net income decreased. The purpose of the EBITA metric is to replace the EBITDA metric for companies that have large capital expenditures that skew the ratio. This way the numbers aren’t drastically influenced by accelerated depreciation amounts and analysts can see if the core operations are profitable while taking into consideration the aging of company equipment. As you can see in our example calculation, Maria actually earned much more from her operations in 2016 than her operations in 2015 despite a decrease in net income during the second year. The main factors decreasing her net income is the interest and depreciation expenses associated with acquiring for the new equipment. EBITA is used to remove the affects of the financing costs, so analysts can focus on the profitability of the company’s operations including the cost to purchase the equipment (depreciation). It’s important to always use multiple metrics when evaluating a business’ performance. For example, just by looking at Maria’s net income, you would think that her business performed worse in 2016 as compared to 2015. That’s actually not true. She increased sales and increased operating profits from purchasing her new machinery. The EBITA ratio shows this dramatic increase in profits. On the other hand, both EBITA and EBITDA can drastically skew the perception of a company’s health and profitability. Since neither of these metrics take into account the cost of debt, they don’t show a true picture of the company’s health. Maria’s EBITA doesn’t include the biggest expense on her income statement: interest expense. That’s why it’s important to evaluate the metrics for their specific purpose. EBITA shows operation profitability while net income shows overall profitability. In business, having a high EBITA number is important, but at the end of the day that needs to lead to a higher net income number. By taking out a loan to grow your business, you may be decreasing your net income in the years following. By tracking your growing EBITA you will be able to see a glimpse of what your future holds after you pay down your debt. 1 Definition: What is EBITA?